MILES aims to raise the profile of STEM knowledge and career development opportunities existing within the state to strengthen the enrollment and retention of students in higher education STEM fields, particularly those aligned with the MILES research theme. Idaho EPSCoR MILES can help you access comprehensive career information, resources and services to help you make successful education and career decisions. We can also help you sort through the MILES-related majors to help you identify a major that works best for you. Finally - we can assist you in your job search and getting you connected to employers who are looking for someone with your skills and background. See below to get started! Whether you're looking for that perfect job, that perfect employee or information on an industry or workforce, IdahoWorks is for you. JobScape is an easy-to-use tool designed to help job seekers and students make informed career and educational decisions. 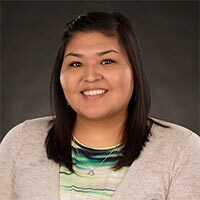 Laticia Herkshan graduated with a double Bachelor's degree in Political Science and Anthropology and a minor in American Indian Studies from ISU this past May. This fall she is starting the Doctoral program in Political Science at ISU. She was awarded a Graduate Fellowship. While completing her Bachelor's, Laticia was a MURI student. She worked on pulling together and administering a survey for the Shoshone Bannock Tribes. The survey looked at Tribal responses to Ecosystem Services. For her graduate work, Laticia plans to continue working with the Shoshone Bannock Tribes, researching not only Ecosystem Services, but also the governance structure and process of doing survey research with the tribes. In addition, Laticia has had conversations about running surveys during a larger gathering of regional Tribal groups. Laticia will continue to her work with the MILES grant. Originally from Madras, OR, Laticia came to Pocatello in 2010. She is a member of the Shoshone Bannock Tribes in Fort Hall and a descendant of the Klamath Modoc Tribe in Southern OR and the Tohono O'odham Nation in Southern AZ. Laticia's goal is obtain her doctoral degree in Political Science so she can work as a policy adviser for her tribe. 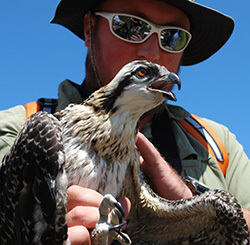 At Boise State University, students studied osprey breeding and habitat in Idaho alongside College of Western Idaho (CWI) biology professor Dusty Perkins as part of a MURI internship. Students had the chance to handle osprey nestlings and work up close with the birds of prey as part of a project to research contamination of Idaho landscapes. Osprey, which have adapted to human environments, are a "sentinel species" – monitoring their health allows researchers to examine the well-being of their habitat. In other words, studying them doesn’t just tell us about the osprey. It tells us about every species and landscape they interact with. It was a great opportunity for students to learn about some of Idaho’s fascinating wildlife not in the classroom, but in the field. And best of all, it brought together students from Boise State and CWI - the kind of institutional collaboration that EPSCoR works to further. "Students who participated became empowered by the process. Since the completion of our summer research, one student in an affiliated summer program (BSU/REU) transferred to University of Idaho and is now working in the conservation genetics lab run by Lisette Waits. Another, Zach Sanchez, has begun working with Rebecca Flock (an environmental chemist at CWI) to evaluate water quality issues in the Boise river watershed." Very impressive work from everyone involved. And in the interests of full disclosure: some of us are a little jealous that they got to handle some amazing birds of prey! 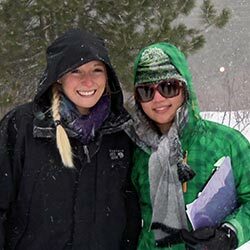 Idaho State University student Clarissa Enslin investigated the dynamics of the rain-snow transition zone in southwest Idaho mountains. Working alongside professor Sarah Godsey, Enslin examined a complex climate relationship: How does the distribution of snow impact how watersheds respond to mid-winter rain? Using a modeling program called iSNOBAL, developed by a team with the Western Consortium for Watershed Analysis, Visualization and Exploration (WC-WAVE), Enslin found that five factors work together to determine how meltwater and rain impact streamflow during what’s known as a “rain-on-snow event” - which is exactly what it sounds like. Those factors are the initial snow conditions, how it rests on the mountain, its elevation, the wind, and vegetation. What does it all mean? Early results indicate that more frequent years with less snowfall - and therefore less snowpack - will have a serious impact on water availability, biochemical processes in the soil, and Idaho ecosystems as a whole. Tools that allow researchers to predict these impacts, like iSNOBAL, give us an edge in dealing with them, and preserving the value of Idaho’s lands and waterways. Click on a MAJOR (below) to see a list of potential occupations with links to details about that occupation.